Press-Mark And List Of Contents, In A Collection Of Tracts On Shorthand, Music, Etc. bl.uk > Online Gallery Home	> Online exhibitions	> Illuminated manuscripts	> Press-Mark And List Of Contents, In A Collection Of Tracts On Shorthand, Music, Etc. In the Middle Ages the cost of binding books was a considerable part of the overall expense of creating a manuscript, so, rather than bind short works individually, several different works--having more or less in common with one another--would often be bound together. This volume, of only 80 leaves, contains a dozen texts, originally written as several different sections. A late medieval list of contents and press-mark on a flyleaf shows that it used to contain even more texts, and belonged to the library at the abbey of Bury St. Edmunds. 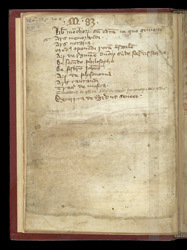 The bold 'M 83' at the top of this flyleaf is a typical Bury press-mark (the 'M' probably stands for 'Memorandi', indicating the first item in the collection), and below this a list of contents headed 'A book of the monks of St. Edmund, in which are contained . . .' followed by a list, beginning with 'Ars memorandi', now missing from the volume. To the right of the press-mark is 'H de K', a mark of Henry de Kirkstead, a 14th-century Prior of Bury.